Megan Lavey-Heaton is half of the creative team behind Namesake, a fantasy webcomic about a woman who falls down the rabbit hole into the wrong story. Along with fellow co-creator Isabelle Melançon, she is co-editor of Valor Anthology and is doing the book's design. She also penned the script for the short story "Silver Button" and was a contributor to Womanthology. She also lends her talents in designing newspapers to book design and lettering comics, including Namesake. 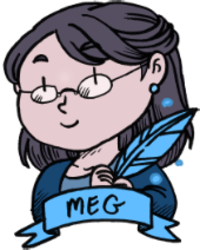 She has done book design and layout for Sister Claire, Go Get a Roomie, The End and Blaster Nation. When she is not writing or reading every book she can get her hands on, she is a web producer with PennLive.com. She is also a crafter, gamer, and Whovian. She enjoys playing with classic literature and twisting history to suit her purposes.